One of the most important mechanics is going to be the fire resolution, of course. We want a system that is simple and fast, yet that takes into account firepower, distance, cover, attacker quality, and type of fire. That definitely means a table with modifiers. This first version is a starting point, and we have made almost no statistics calculation so far, this table is just based on a hunch. The top row indicates the firepower brought to bear on a unit. For reference, a firepower of one corresponds to the firepower of one fireteam. So a normal squad would roll on the 2 column. The rules for base of fire will allow multiple units to add their firepower, as long as they are in base contact. That's how you can arrive at 8 firepower here. The leftmost column represents the die roll. A D6 is rolled. A range of modifiers will allow players to roll a -2 or a 9. Modifiers will include target cover (a minus modifier, meaning less effect), attacker leadership (plus or minus, more is better), range and visibility (plus or minus), attacker troop quality (elite are plus - greens are minus), overwatch (plus), and so on. The list is bound to be long, and will most definitely change during playtesting. Another way of influencing the statistics is allowing a double roll, counting the best result, or maybe imposing a double roll, counting the worst. 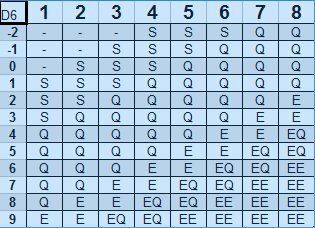 The rest of the table represents the results: S stands for suppressed, Q stands for a quality check, E stands for elimination. A result of E means a Squad is reduced to a fireteam, a fireteam or crew are destroyed. A result of EQ means a Squad is reduced to a fireteam (eg. halved) and then is submitted to a quality check. A result of EE means a Squad, fireteam or crew is destroyed. A broken squad that breaks again is reduced to a fireteam. A broken fireteam or crew that breaks again is destroyed.